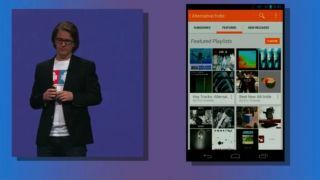 Android Engineering Director Chris Yerga stood up at the Google IO keynote this morning in San Francisco to introduce Google Play Music All Access, Google's new monthly subscription music offering. "So you guys want to hear about music?" Yerga asked. He called Google Play Music All Access "a uniquely Google approach to a subscription music service." He said All Access will help guide users through a world of tunes without hassle. The service will include music recommendations made by automatic algorithms as well as specially curated recommendations and playlists. All Access users can essentially create a radio station based on any artist or song, then browse recommendations provided by Google, or search by genre. It's "a music service that's about music, and the technology fades to the background," he said. The service will make it easy to view upcoming tracks and "swipe away" unwanted tracks, a flexible approach that should help it compete against services like Pandora and Spotify. Yerga called it "radio without rules." Users can store 20,000 for free in the cloud and listen to them alongside Google's All Access catalog. Google Play Music All Access includes library, radio, and "listen now" features and is available for $9.99 (around UK£6, AU$10) per month today in the U.S. Google will also offer 30-day free trials, and those who start a trial before June 30 will pay only $7.99 (around UK£5, AU$8.09) per month. The All Access page promises no ads and unlimited skips, but we'll see if that holds true as adopters start signing up. Google Play Music All Access will be available in more countries soon, Yerga promised.